More than a hundred years after the ship went down, the myth of Titanic has not stopped fascinating people. 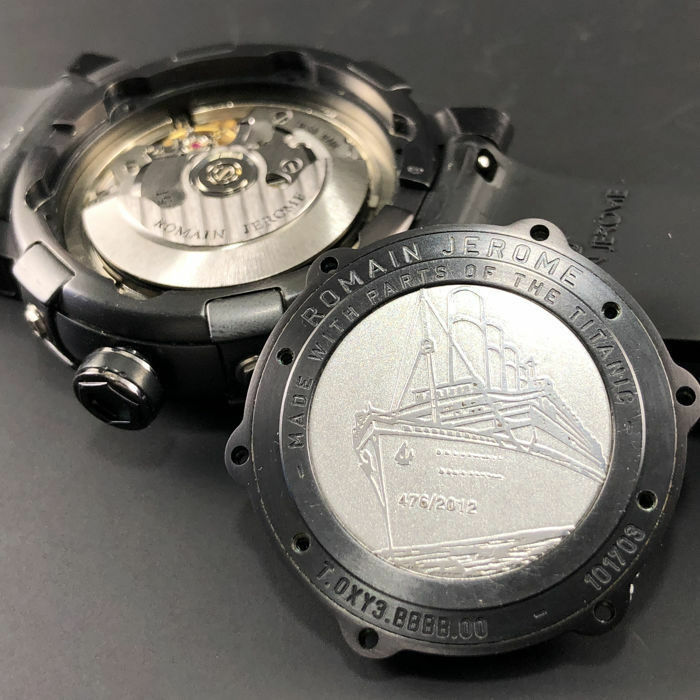 In memory of the terrible disaster and victims of the passenger ship, watchmaker Romain Jerome made an exclusive and limited series of watches - "Titanic DNA". April 15, 2012 was the 100th anniversary of the tragic story when RMS Titanic sunk. The catastrophe is still not forgotten and the movie with the same name as the ship, directed by James Cameron, is as popular as when it premiered in 1997. 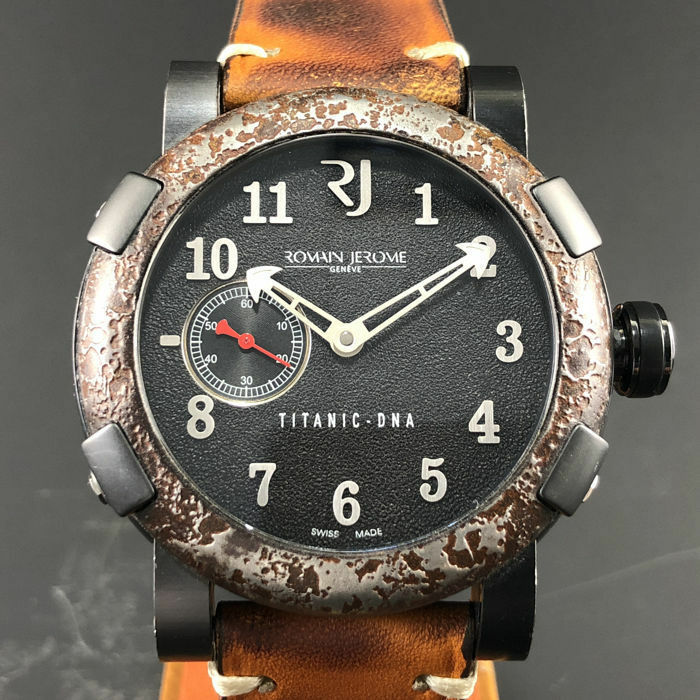 In regard to the anniversary, the watchmaker Romain Jerome (RJ Watches) created a very special series of watches to commemorate the memory of the disaster. The watches from The Titanic DNA series were partly made of metal from Titanic's wreck. The parts were melted into stainless steel which gave the watches an older appearance. The collection consisted of several different models, each of which was made in only 100 examples with prices up to 14,000 CHF. Catawiki recently auctioned a Titanic watch for 4,000 euros. To make a watch with parts from Titanic, the material must of course be available. This was made possible as dives to the wreck are done occasionally. The dives are not strictly reserved for professionals, individuals can dive into the world of adventure in exchange for a considerable sum. Engraving of Titanic on the back of the watchflake. In 1985, underwater detectives Robert Ballard and Jean-Louis Michel made the 3,803 meter long trip down to the wreck on the bottom of the Atlantic. The following year, the first manned diving took place with a specially built submarine. Since then, several artefacts have been transported to the surface again to be exhibited at museums or to be auctioned off. 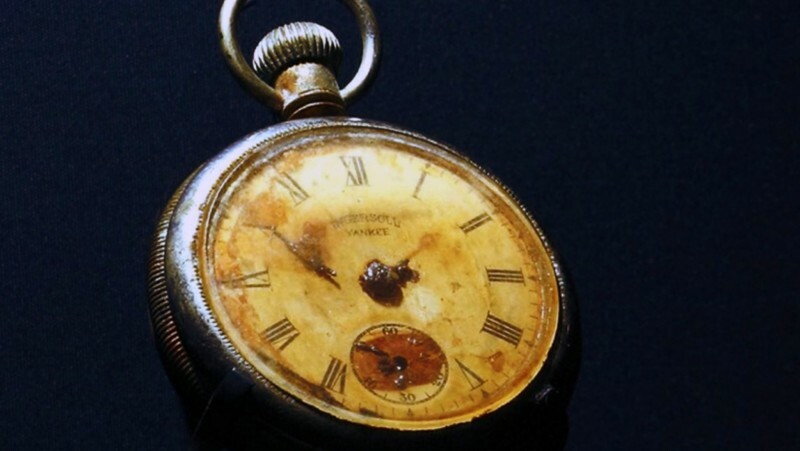 In 2008, a pocket watch which belonged to first class steward Edmund Stone was up for auction. Stone died at the ship's downfall. The watch was sold for 130,000 euros and became the most expensive item from Titanic ever auctioned. Obviously, watches were nothing unusual on the Titanic ship. Both staff and passengers, especially those in first class, wore pocket watches since wrist watches were unusual in 1912. Many of the cabins on the ship had a table or wall clock. 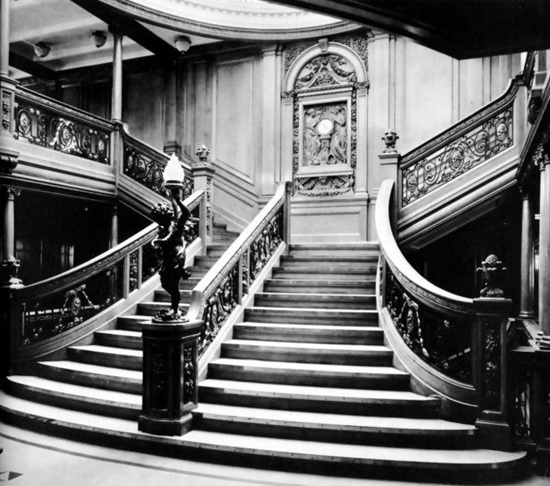 The most famous watch from Titanic is undoubtedly the one that hang above the first-class stairs. Straight under the big glass cupboard ceiling, housed in a wood paneling with Art Nouveau motifs, the clock showed the time for all passengers. In addition to faulty construction and lack of safety equipment, it was time itself that posed as the biggest threat when Titanic sunk during the night between 14 and 15 April 1912. When the iceberg was discovered, it only took 30 seconds until the ship collided with the iceberg. After that, the people aboard the boat had only two hours and 40 minutes to secure themselves in the few lifeboats that existed. Time was clearly not on the Titanic’s side. If you want to dive into the above-mentioned adventure and see the wreck on the seabed, which costs about $100,000, it's time to hurry. Scientists believe that the wreck will be completely destroyed within 20 years due to metal biodegradable bacteria. Several exciting stories are to be found among Catawiki's thousands of items up for auction every week. Discover more here! Or maybe you own an exciting item that you would like to sell? You can read about how easy it is here.